First of all I would like to say thank you to knitter Mysparetime and knitter Punkin for pointing me towards Elizabeth’s Zimmerman’s sewn bind off technique. Thank you so much, I really appreciate your help! By the way, I always appreciate it when readers leave me a comment. I very much love to hear from you and it has been more than once that commenters inspire me and get me going on writing patterns. Secondly, I would like you to know that it is time for me to give this whole weblog thing some serious thought. Don’t get me wrong, blogging has been a real pleasure for me ever since I started “Getting Purly With It .” I really love doing this but it is time to reflect on how to proceed. Several questions have to be answered. Where do I want to go with “Getting Purly With It”? Will I be issueing more free patterns yes or no? If so, in what frequency? Will I continue making pitcure tutorials? How much of my personal life will I reveal in the public space? Will I have themes? Will I write more prose, which I so love to do? Also, in these last few weeks, I have been so incredibly inspired to make all kinds of knitted items. It is like the gates of inspiration have been thrown wide open and all these cute and lovely images are just floating around in my mind. I want to capture them all and knit them up! So… I really need to give it all some structure. Besides all this, I am planning on teaching some classes at Sally Palin’s shop Closeknit on Alberta Street. Having all this said, it is time for me to take a little break from blogging. Focus, structure, planning, designing, is what I am going to do in the next few weeks and surely you will understand. Thank you all so much for visiting my little tiny space in blogosphere! And for those who have knitted my little patterns, I want you to know that I am honored, for sure… I really do appreciate your visits! I will be back soon… I promise. I am toast… my brains are fried. I have been working all day at my favorite tea shop to finish Tristan’s scarf and fingerless gloves. Writing out the pattern, testknitting three different sizes, calculating this and that, taking pictures for the step by step picture tutorial. 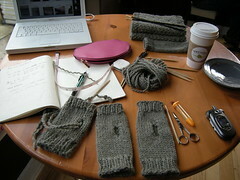 And finally finishing the scarf and gloves in order to ship it today. After explaining to him that I need his hand to test out the Large size I knitted up, he gladly helped me out. I started to bug every guy that came into the teashop. Guys with small hands, medium hands and large hands were all made model victim and sure enough, all said the same thing: “Fits perfectly… but too tight at the top”. Dang it. I thought I had it figured out. 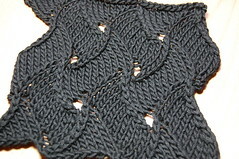 Too tight at the top… I did my bind off very loosely! So if you have a minute, dear reader, and if you know of a good stretchy bind off tutorial somewhere on the net, could you please help out this knitter and leave me a comment notifying me about it? I am calling it a day… time to head on home and get dinner ready. Which swatch will speak to her..? My mother in law, Christine, is going to be so surprised. 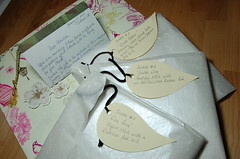 Yesterday, I prepared a little package for her filled with three swatchy gifts. Rather than just going ahead and knit her a shawl with a stitch pattern I choose for her, I want her to be involved in the creative journey and make it all a special experience. So I tagged the three swatches with leaf shaped notes and wrapped each swatch individually in tissue paper with the leaf tags hanging out. I am so excited by this and I sure do hope she genuinly likes one of the swatches. Off to New York her package went today! It looks better…way better now! 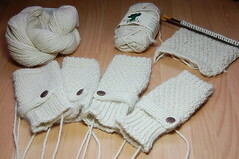 I knitted the glove in the round (upper glove in pictures below) and there are no bulky seams. 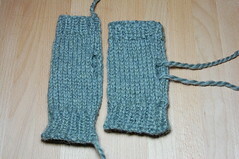 I think I am going to write this “manly” fingerless glove pattern in three sizes (S, M and L). That’s it for this entry… I need to get going writing up the pattern for Tristan’s Scarf and Glove. 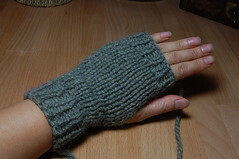 I also need to get going writing up the pattern for fingerless Glove Sally! This is all a labor of mere passionate knitting love. 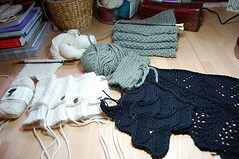 Then, I have to get going finishing up my grey top… and besides all this, my head is just exploding with new designs! Oh the excitement… I LOVE IT. I am all over the place… usually, I have just one project going and I work on it untill it is finished before I proceed to the next. 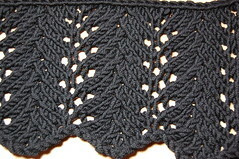 But all of a sudden, I got several projects on my needles. 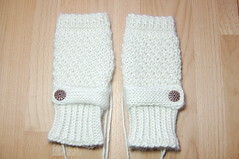 When I was working on fingerless glove Adrienne, I came up with this fingerless glove with button. I have named this one “Sally” in honor of Sally Palin, the owner of yarnshop Close Knit on Alberta Street in Portland. 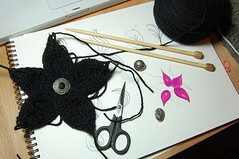 As soon as I am happy with the final result, I am ready to write up the pattern and testknitting begins. 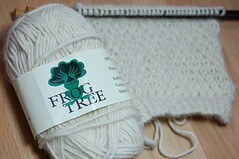 Right now I am testknitting with Frog Tree’s 100% worsted Alpaca. There are 87 yards of yarn in this skein and I am assuming that it will be more than enough for a pair of fingerless glove Sally. However, I need to be a 100% sure before I put out the pattern for you to knit up! 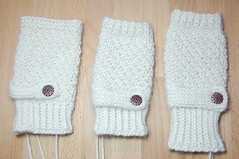 All in all, I am happy with this cute fingerless glove… I especially like the button! 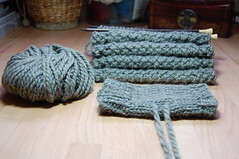 Next up are Tristan’s scarf and glove which I am making out of Misti Alpaca Chunky. I bought 3 skeins in Colorway Moss Green and want to get both scarf and glove out of these skeins. 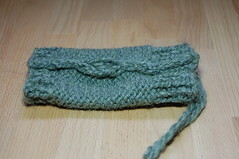 I am not sure how this stitch is called… moss stitch I assume, but I am not sure. 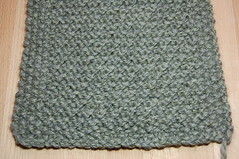 Anyways, in Tristan’s scarf I use this stitch in the middle part and the first and last 4 stitches are done in seed stitch. 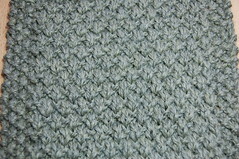 This yarn is chunky, thus creating enormous bulk at the seam. Me don’t like… me don’t like at all… Not tight and in harmony at all! It looks cute though, but I am thinking of making this one with double pointed needles (ugh) to eliminate the seaming alltogether. In that way, I get rid of that bulk on the side. 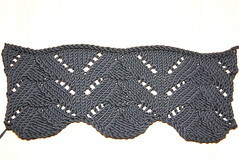 Tomorrow, I will head out to Sally’s shop to get some US #9 double pointed needles and finish a pair of gloves. With the yarn that is left over, I will finish the scarf. And yes, you know it, I will post both patterns for free! My mother in law, Christine, called me with a special request… She told me that on Christmas day, when she was all dressed up and ready to go to her daughter’s to have Christmas dinner, she did not want to put on her heavy coat and wished that she had a shawl to put over her shoulders. 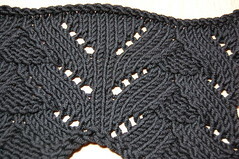 In my book, Christine is a “really really very special person”, and yes, I will be happy to make her an elegant shawl. 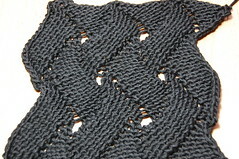 She loves the color black and she really would like a rectangular shawl. 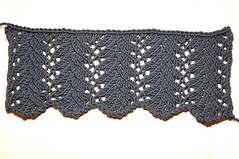 What type of shawl does one make for a very classy and stylish lady? A lady that always wears the most elegant dresses, high heels, perfect hair and make up? I very much like all three patterns and will send the swatches to New York so that Christine can choose which one she likes best. I am so curious which one she will like best!!! Thanks for reading this long post and untill the next entry! HAPPY NEW YEAR!!! MAY ALL YOUR WISHES COME TRUE IN 2008! You are currently browsing the Getting Purly With It blog archives for January, 2008.